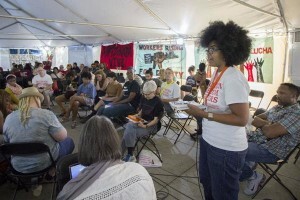 (APN) NEW ORLEANS, LOUISIANA — Ten years after Hurricane Katrina devastated New Orleans, Louisiana, organizers from Atlanta traveled there to participate in a week of action, from August 23 to 30, 2015, under the banner of Gulf South Rising. Atlanta Progressive News traveled to New Orleans to observe first-hand. Gulf South Rising is an initiative launched earlier this year by grassroots organizations that began holding Climate Justice Assemblies in 2010. “We’re here in New Orleans. We’re in a place where the entire public school system was closed and then replaced with a charter school system,” Emery Wright, co-director of Project South told APN. “As people from Atlanta, it’s not only critical to be in solidarity with New Orleans because it’s the right thing to do, but because now the same legislation that they used to make all that happen in Louisiana has been passed in Georgia,” Wright said, referring to legislation that Georgia lawmakers passed earlier this year that created a ballot initiative to allow the state to take over so-called “failing” schools. “We are going to face some of the same effects of that legislation where charter school districts are able to usurp democratically elected structures like school boards,” Wright said. “What happens in Louisiana is writ large across the South,” Stephanie Guilloud, co-director of Project South said. Four hundred people gathered in tents erected in and around Congo Square, in downtown New Orleans, where slaves used to come together on Sundays to dance, drum, and hold religious ceremonies. Years earlier it was the site of an annual Green Corn Ceremony held by the Houma, an indigenous community that was forced by colonizers to migrate south. Now, members of the United Houma Nation live on Louisiana’s quickly disappearing coast. United Houma Nation Chief Thomas DarDar opened the SMA with a ceremony, and then spoke about the challenges facing his community. “When you start talking about tidal rise, land loss, we’re one of the first peoples to be impacted… we have an island that we call Isle de Jean Charles where we had five hundred citizens living before Katrina. Now we only have 25 families that live in that area,” DarDar said. At the close of the two-day assembly, spokespeople from five focus groups shared ideas and proposals with the entire group. Over the coming weeks, the SMA governing council will synthesize the information into a strategic action plan. Other Gulf South Rising events included a Black Lives Matter panel, a protest vigil at the site of a former public housing complex, and a march from where the levees breached in the Lower Ninth Ward. The theme of the week of action was “Resistance, Not Resilience,” a message intended to elevate the experiences of the people hardest hit by Hurricane Katrina, most of whom have not benefitted from recovery efforts. “What people need to understand is that those billions of dollars that came to the Gulf Coast after Katrina never made it to the frontlines. They never made it to the communities that people saw on television,” Colette Pichon Battle, director of Gulf Coast Center for Law and Policy and lead coordinator of Gulf South Rising, said. Blacks make up 59 percent of the City population but 90 percent of the City’s prison population. 99 percent of all juveniles arrested in New orleans are Black. Median income for Whites rose from 49,262 dollars in 2005 to 60,553 dollars in 2013. For Blacks it rose from 23,394 dollars to 25,102. The unemployment rate is more than double for Blacks than for Whites. Public housing units in New Orleans decreased from 5,146 before the storm to 1,976 today, not because the storm damaged them but because the City Council unanimously voted to demolish the unscathed buildings after the storm. In the predominantly Black neighborhood of New Orleans East, grants to rebuild fell short by an average of 69,196 dollars per household, compared to an average shortfall of 44,405 dollars in a White neighborhood only eight miles away. “The narrative of the City and the Mayor and the people in power is that we are resilient,” Eric Harrison, an intern at Gulf Coast Center for Law and Policy, told APN. “There’s nothing wrong with being resilient, except the fact that it implies that they can continually hit you, punch you, kick you, and you will keep getting up and dusting yourself off, pulling yourself up by your bootstraps. Being resistant is stopping that person from stomping on you while you’re down… we are very resilient, but if we can start being resistant with that resilience, then we will be a force to be reckoned with,” Harrison said. The GCCLP began the work of convening these types of Assemblies after learning about the People’s Movement Assembly model at the U.S. Social Forum in Atlanta in 2007. Since 2010, there have been seven assemblies where participants from Texas, Louisiana, Mississippi, Alabama, and Florida collectively created a strategic plan for advancing environmental justice in the region. “[The assemblies] are a really helpful tool and process for helping people to understand what is happening to us and to draft our own solutions for how to move forward together,” Colette Pichon Battle, director of GCCLP and lead coordinator of Gulf South Rising, said. GCCLP is also one of the anchor organizations of the Southern Movement Assembly, another forum based on the People’s Movement Assembly model. The Southern Movement Assembly (SMA) convenes organizers, artists, activists and educators from different frontline struggles in thirteen southern U.S. states, as well as Puerto Rico and Detroit, Michigan. Representatives come from communities working on voting rights, state-sanctioned violence, food sovereignty, environmental racism, and many other issues. Through a series of large and small group discussions and activities, they develop a shared political analysis and plan of action that informs their work over the coming year. Project South, headquartered in Atlanta, is the anchor organization of the SMA, which hosted the forum last year. This year’s SMA took place in New Orleans as part of Gulf South Rising’s week of action, and included participants from the Gulf South Climate Justice Assemblies.